Stuffing is one of must-have side dishes at a holiday dinner, of course. 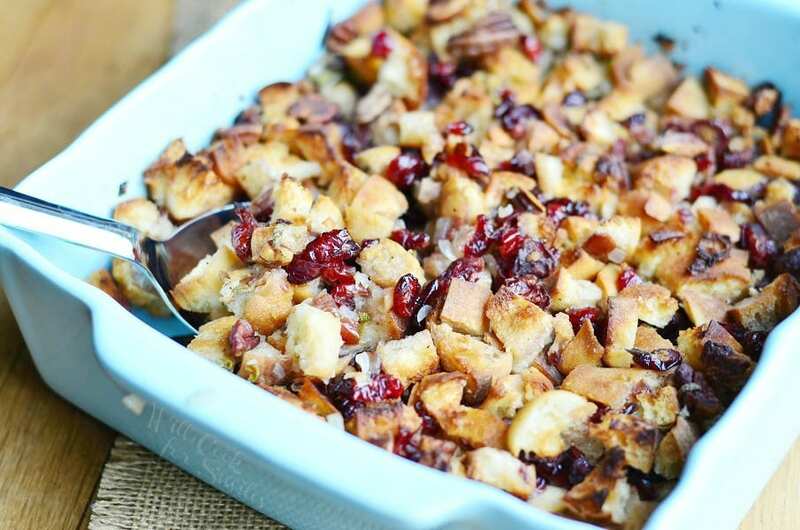 I’m excited to share with you my recipe for Cranberry Stuffing with Pecans. I never know what to call this side dish. Is it stuffing or is it dressing? I know, the best explanation is that if it’s cooked inside the bird, it’s stuffing, and if it’s cooked outside the bird, it’s dressing. But that has not been the case in my experience since I’ve heard it being called both ways no matter the preparation. I’ve also been corrected both ways. Some insist that it should be called “dressing,” while others just refer to it as “stuffing” even if prepared outside the turkey. So after doing a little research, I found out that it mostly comes down to geography. Those in the southern states almost exclusively refer to this side dish as “dressing.” Those in the northern states, refer to it as “stuffing,” whether it was cooked inside or alongside the turkey. This could explain why I kept hearing it both ways, as Florida is a big mix of southerners and northerners. 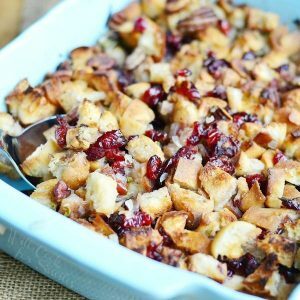 Either way you want to call it, this Cranberry Stuffing will be a great addition to your holiday menu. 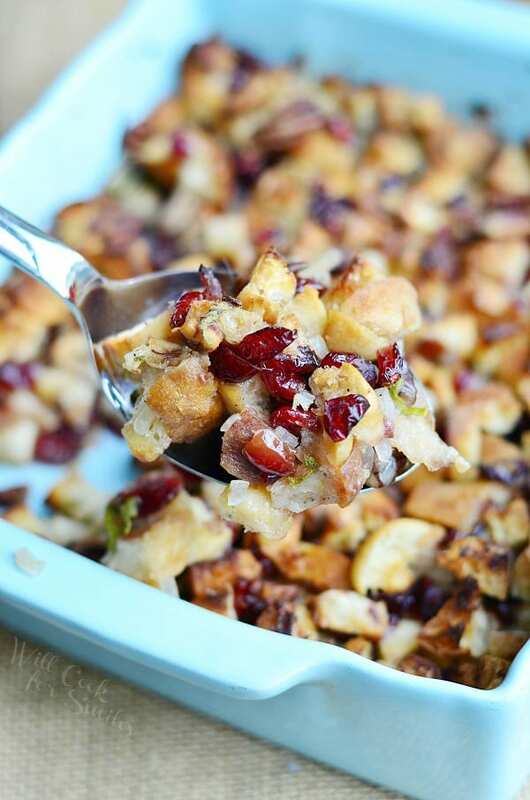 This stuffing is a wonderful side dish made with cranberries and pecans. Cut bread slices into small cubes that are about 1/2-inch in size. Use serrated bread knife to cut easier. Spread bread in two large, rimmed baking sheets evenly and place the trays in the oven. Let them bake and harden for about 2 hours. Take them out and you can prepare the stuffing right away. 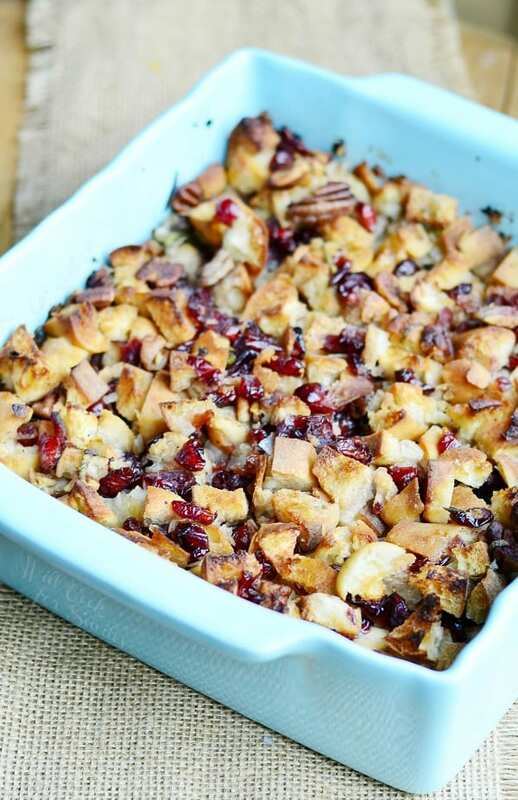 About an hour before making this stuffing, combine cranberries, vinegar and 1 cup of broth in a bowl and let it soak. Drain cranberries but do not discard broth. Preheat saute pan, over medium heat. Add oil and onions and saute until onions are transparent. Add 1 cup of broth and cranberry broth. Bring to simmer and add salt, pepper and minced sage. Take off heat and let it cool down a bit so the egg doesn't get cooked. Preheat the oven to 350 and grease a 9x9 baking dish. Place dried bread, cranberries, and pecan to the large mixing bowl and mix. Whisk eggs and mix them with broth mixture. Add broth mixture to the mixing bowl and mix well everything well. Transfer into the prepared baking dish and pat it down. Originally published on Will Cook For Smiles on November 14, 2014. It’s hard to pick one, but, if pressed, I’d pick the Jalapeno Citrus Olive Oil. I would love to try the roasted garlic olive oil. Would love to try their champagne vinegar ( http://www.ooliveoil.com/store/best-sellers/champagne-vinegar.html) in my salad dressing along with EVOO of course…I’m craving salad just thinking about it! This giveaway is stupendous … I’d love to win…thanks for hosting it. I would love to try the Meyer Lemon Olive Oil. What a beautiful side dish. Sounds delicious and looks so festive. Perfect for the holiday table! Gorgeous! 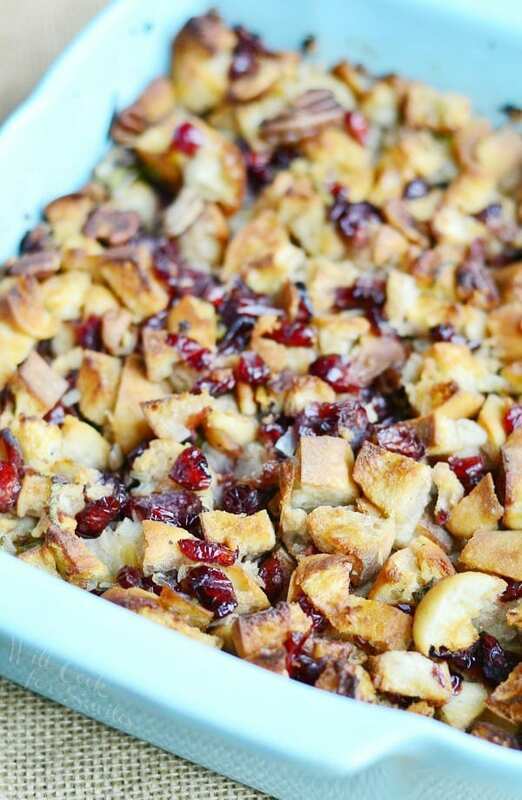 I think the tart-sweet of the cranberries is a perfect addition to stuffing. And yes, we always call it stuffing, even though we never prep it in the bird. 🙂 We’re rebels like that! I don’t think I’ve ever even tried it cooked in bird. If there is Meyer Lemon that is always my first choice. Love the sweet citrus taste. Hi! Just wanted to let you know that I included this gorgeous stuffing in my Thanksgiving Recipe Roundup! The O Basil & Blossom Oil & Vinegar Sampler is my favorite,I could make so many different dishes with that! I love this brand and at one time had every flavor of oil an vinegar, but now I see they’ve added more flavors.